Hard work and a hands-on approach have reaped rewards for chef Jackie Hildebrand. For many, the adage “do what you love and you’ll never work a day in your life” seems like farfetched advice. Life gets in the way, and passion fades to hobby, if anything at all. That’s not the case for Jackie Hildebrand, the executive chef of Hy’s Steakhouse and Cocktail Bar. “I blinked, and I was here for 14 years,” she says. In a high calibre kitchen where perfection is expected at every level, the best learners tackle every task, no matter how small, with gusto. Like a sponge, the young chef absorbed any and all information thrown her way. She learned from other chefs and by getting her hands in everything. After three years of hard work, she became sous chef. In January of this year Jackie was promoted to executive chef – the first female executive chef across the five Canadian locations in Hy’s 63-year history. Jackie still tries to replicate the family recipes she grew up cooking with her grandmothers, and today carries on tradition by passing her culinary knowledge to her 10-year-old niece. Her family has always encouraged and supported her dream, she says; at seven years old, she told her mom she wanted to be a chef and by 9 was enrolled in cooking classes. After attending Red River College’s culinary school and working through school work placements and jobs after graduation, she discovered what she loved most was being hands-on and on the line at a restaurant. Even as Executive Chef, she continues to do the perhaps less glamourous work, leading by example and not letting ego get in the way of creating delicious dishes. The day starts at 9 or 10 am. First there’s paperwork or kitchen prep, like making sauces or baking, and then Jackie is on the line, cooking in the kitchen for lunch. In the afternoon, she does more administrative work, like invoices and scheduling, but is back in the kitchen for the evening shift. This is perhaps contrary to the popular image of a head chef barking orders and ruling the kitchen with an iron fist. But Jackie says she knows from experience that yelling in the kitchen isn’t effective. People shut down and don’t respond. Instead, letting passion shine through hard work inspires others to do their best work too. Striking a balance between discipline practices delivered with a soft touch pays off, she claims. Sometimes it means lending an ear to a cook seeking comfort or encouragement, recognizing that she can make an impact on other people’s careers. This hands-on approach means she is still doing what she loves: cooking and obsessing over ingredients, procuring the best she can get. Climbing up on a food truck making its delivery to examine new products on offer is not uncommon for Jackie – she discovered some top-notch local produce this exact way. She has also evolved the menu to fit new trends or dietary needs; and shares freely with other chefs in Hy’s network. A three-course vegan meal she developed for a client was such a rave it initiated conversations among her colleagues across the country and prompted other creative solutions for vegetarian diners. The fall menu’s meatless meatloaf, showcased in this feature, was instantly met with approval and has become an enormous success. Hy’s has long recognized the importance of keeping everyone at the dinner table happy, all while keeping the high quality standard of the menu’s core items. For the majority of her career, chef Jackie has simply dedicated herself to the work without letting surroundings affect her. She knew what she wanted from a young age and focused on getting it, oblivious to distraction. That’s the advice she has for others, particularly young women, entering the culinary industry: Do it because you love it, work hard, be willing to learn as much information as you can. It’s worked for her, and is what keeps her from getting burned out in an industry that is physically and mentally demanding. It’s fitting that a career that started with family in the kitchen continues down the same path. 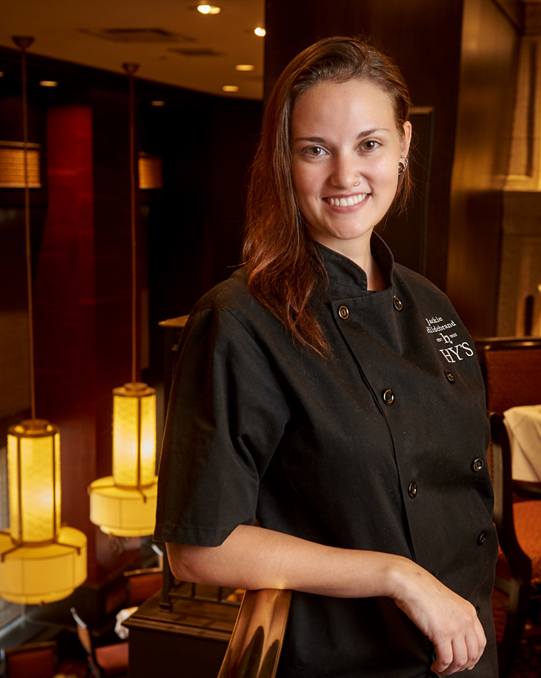 Chef Jackie calls her kitchen team her family – the same comfort she felt in her family kitchen from a young age also exists in Hy’s kitchen today. It’s part of the reason her job doesn’t feel like work – she loves what she does and those she does it with.